Prepare for Fed Statements Starting With "We Did Not Foresee..."
The Fed doesn’t want to raise rates. The Fed knows the economy’s health is a mirage based on near-0% interest debt. The Fed has to raise rates. Inflationary pressures are becoming more evident every day. The Fed wants its cake, wants to eat it, too, and wants to clone it so it can have it again later. While it eats it, too. Again. Overreacting, once it’s already too late, would be par for the course. Do nothing that might cause any short-term discomfort in exchange for even a very significant long-term improvement as long as you can trade a slight lessening of pain now for eventually unavoidable and excruciating pain at an unspecified later date. In this rate-hike cycle, the Fed has engaged in policy action only at meetings that are followed by a press conference. There are four of these press-conference meetings per year. The next two are this week and June. The Fed’s target range for the federal funds rate has been 1.25% to 1.50% since its last rate hike at the December FOMC meeting. 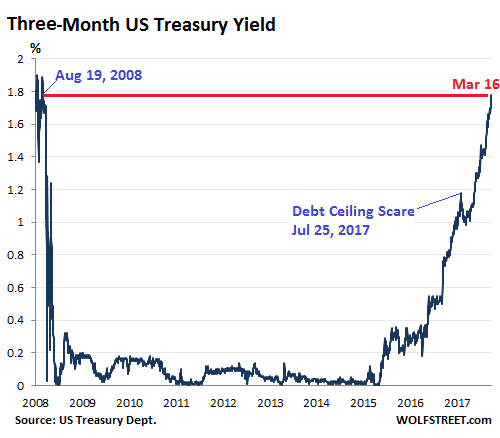 In other words, the three-month yield is already above the upper limit of the Fed’s target range after the next rate hike. So the market has fully priced in a rate hike at the FOMC meeting ending March 21. And it’s also starting to price in another rate hike in June. If, in this cycle, the Fed hike rates at an FOMC meeting that is not followed by a press conference – there are also four of them this year – it would be considered a “monetary shock” that the Fed decided to administer to the markets. It would be like a rate hike of 50 basis points instead of the expected 25 basis points. There would be a hue and cry in the markets around the world.